Director of Marketing and Customer Service - Thordon Bearings Inc.
Craig Carter has been involved in the promotion of non-polluting bearings for the marine, clean power generation and offshore industries since 1996. Currently, Mr. Carter is the Director of Marketing and Customer Service with Thordon Bearings, a manufacturer of a complete range of zero pollution propeller shaft, rudder and shaftline products for the global marine market. He has been involved with Transport Canada’s presentation at MEPC58 and has presented to the IMO at DE56 regarding solutions to eliminate operational discharges from ships. Prior to Thordon Bearings, he was involved with international marketing at Acadian Seaplants Ltd., a manufacturer of seaweed plant biostimulants, natural fertilizers and edible seaweeds based in Dartmouth, Nova Scotia. Born and raised in Newfoundland, Mr. Carter holds a Bachelor of Commerce from Saint Mary’s University and an MBA from Dalhousie University, Halifax, Canada. Why would any shipowner take the risk of using oil lubrication in the fragile Arctic ecosystem? Shouldn't the oil leakage rules in Polar Code proposed by the US match US EPA rules? If you are a ship owner trading in US waters, take note of new Vessel General Permit requirements. Good news for ship owners and the marine environment. Ship owners who are thinking about building ships for the future need to consider a bunch of operational issues. Good for the environment! No risk of oil pollution fines! Reduced operating costs! Why settle for oil based lubricants on your ships? You don't need to report seawater to the Coast Guard. Two thirds of the world is covered in it - the most obvious and compliant Environmentally Acceptable Lubricant (EAL) is right under our noses - Seawater. Propeller Shafts - lubricated with oil-based EAL's or seawater? Most ships use mineral oil to lubricate the propeller shaft and the oil is contained in the stern tube by the aft seal – which is the oil to sea interface. In most cases, you cannot just replace the mineral oil with seawater or other oil-based EAL's. Oil-based EAL’s need to be compatible with the sealing materials to ensure leakage is controlled – ship owners will need to check with their seal supplier and it may be necessary to upgrade the sealing rings or upgrade to a new seal. Oil-based EAL's may impact on the seal wear life meaning increased maintenance costs. Typically, costs of oil-based EAL’s are 3-4 times more expensive than mineral oils. If you are using a sophisticated air seal, commonly promoted as a non-polluting seal, you are still required to use an oil-based EAL, as it is not possible to guarantee that oil leakage will never occur. 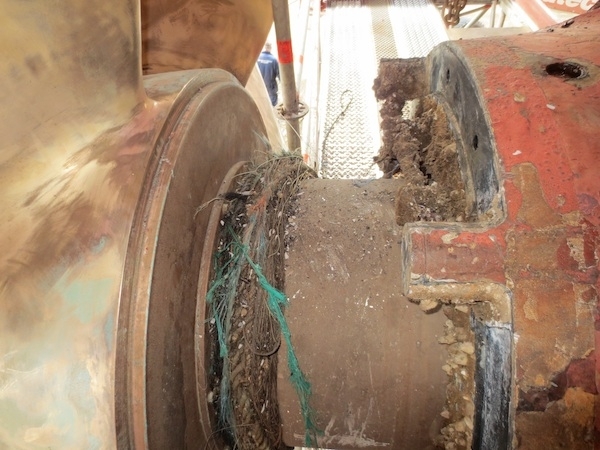 Fishing nets and ropes can still damage the seals allowing leakage to occur. Still a concern for ship owners is that oil-based EAL’s are still considered a pollutant under the Oil Pollution Act of 1990 (OPA ‘90) and US Clean Water Act (if there is a sheen). Any discharges of oil-based EAL’s still require reporting of the discharge to the US Coast Guard, as well as clean-up and remediation costs. Even though biodegradable lubricants may be deemed non-toxic by OECD testing, their presence on the water surface is a threat to seabirds – the hydrophobic nature of oil causes bird plumage to absorb the oil readily, thereby decreasing a bird’s insulation, waterproofing, and buoyancy leading to death from hypothermia and starvation. According to Canada’s Migratory Birds Convention Act c. 22, 1994. - 5.1 (1) No person or vessel shall deposit a substance that is harmful to migratory birds, or permit such a substance to be deposited, in waters or an area frequented by migratory birds or in a place from which the substance may enter such waters or such an area. For newbuildings, many ship owners are now specifying seawater lubricated propeller shaft bearing systems, as over 600 commercial ships have been built with a seawater-lubricated system that uses no oil – meaning full compliance with the VGP. Currently, the U.S. EPA recommends that all new build vessel operators endeavor to use seawater-based systems for their stern tube lubrication to eliminate the discharge of oil from these interfaces to the aquatic environment. Existing ships can be converted to seawater-lubricated propeller shaft systems as these systems typically fit in the same space as an oil lubricated system. Several companies have converted their existing ships from oil lubricated systems to seawater lubricated shafts saving hundreds of thousands of dollars per year on stern tube lubricants and aft seal maintenance costs. This is accomplished during a planned drydock where corrosion resistant shaft liners and a water lubricated forward seal were pre-ordered and the shaft and non-metallic bearings were ready for install when the ship drydocked. So when it comes to discharges from a ships propeller shaft system, the ship owner that trades in US waters has two choices for their existing ships and ships they plan to build: 1) replace mineral oil with an oil-based EAL to lubricate the metal bearings or 2) convert or build a ship using a seawater-based system using non-metallic prop shaft bearings. Some ship owners such as Princess Cruises, COSCO, Disney Cruise lines, US Gypsum Corporation, CSL Group, Algoma Corp., Flinter Group, ConocoPhillips, Carisbrooke Shipping and Staten Island Ferries are already compliant with the VGP, as they have chosen to use seawater as the propeller shaft lubricant and thus have reduced operating costs and have no oil pollution worries.